Jul 16 update - I just realized that the wall shadows on the Cornice and Swan Pediments were screwy so I removed them all together. I play with the shadows off so often that I didn't notice it during testing. All related zip files have been updated. Jul 11 update - The triangle pediment file has been updated due to an issue with it reverting to the LaFenetre Door on diagonal walls. Thanks to poplers for the heads up. Continuing my obsession with classic architecture, I bring you Part I of the Pedimentary, My Dear! Door Collection. This is a collection of pedimented entry doors for your Simmy manses, estates, manors and halls. Each door features a unique pediment style and brightly polished brass hardware. The dimensions of these doors have been supersized. The pygmy-sized 1-story doors in this game have always irked me. 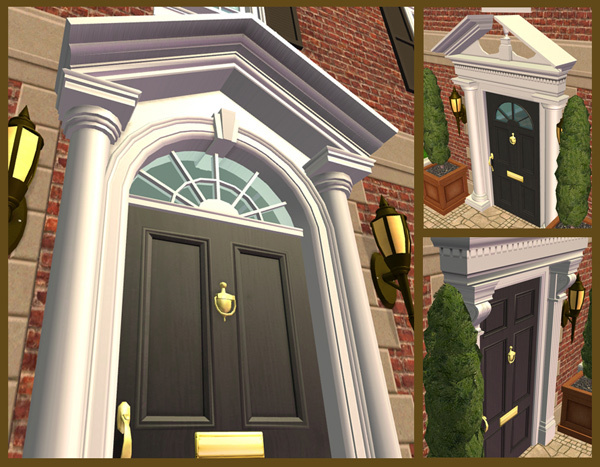 IMO, these doors will give your stately homes a more authentic look. Seriously, what good is a mansion with a puny door? Because of the big sizes, some pilasters/columns will spill into neighboring squares. This *IS* inentional. You'll have no issues placing windows in the overlapped wall spaces, but certain wide windows might intersect the door meshes. It's up to you to choose your windows and spacing wisely. Also, these doors stand well above one wall in height, so the pediments will not so much *peek* over the top of your walls as glare angrily over them. This is probably my highest-poly set to date. How high-poly is this set? Each door averages about 830 polys/tile. To put it in perspective, the huge 2-story medieval door that shipped with University contains 3172 polys. 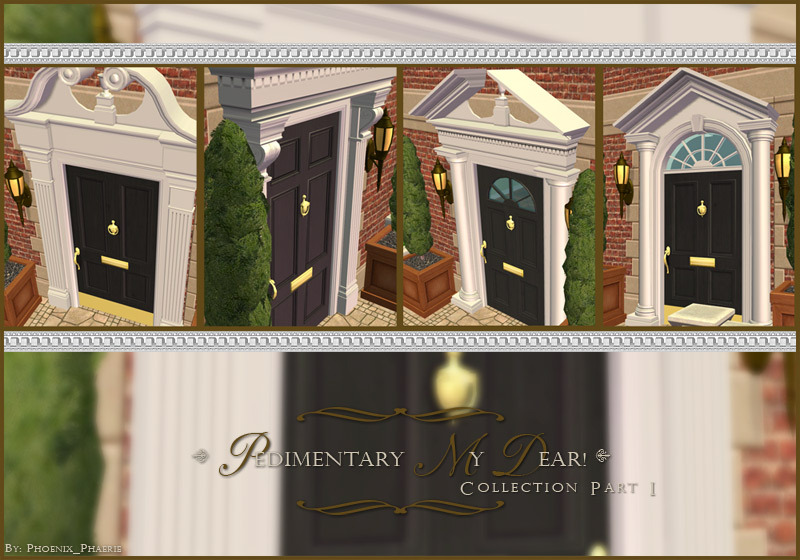 In comparison, the Swan Pediment door in this set contains 3256 polys. It is completely up to you to decide whether these items are worth any potential game lag-time (although, I never noticed any lag in my game even with 6 doors on the lot I used for picture-taking). 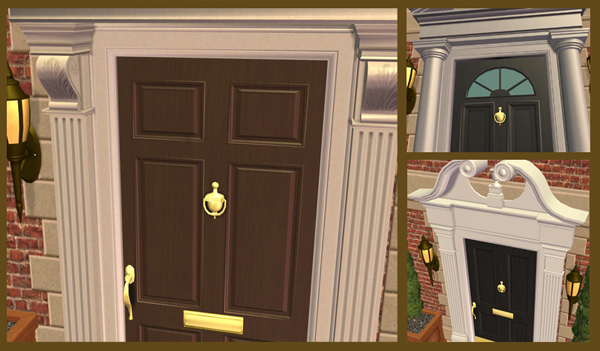 The PedimentaryDoors.zip contains EVERY door and all their assorted recolors. Individual mesh files follow below.